Some may think it’s a simple decision on choosing a roof colour for your roof restoration. In some respects it can be, but it is always good to stop and think about a few things before you decide on what colour you want to paint your metal or tiled roof. It’s exciting to start this process and with so many colour choices available there is no reason why you won’t find the right colour for you and your home! Stop and ask yourself some questions first, to help you focus on what is important to you when choosing the colour. You should consider a number of practical and aesthetic factors that are associated with the colours available. Do you want it to reflect the heat or absorb the heat? Do you want it to match or compliment the exterior colour of your house? What colour has it been and have you been happy? Is it a flat or peeked roof? These are just a few questions to ask yourself before choosing a colour. Dark colours can give your house a bold and sophisticated look while lighter colours can give a feeling of cool and calm. Let’s not forget those gorgeous earthy tones that represent Australia. Go outside and really have a look at what stands out about your home. What colour are the sliding doors and windows? How much green landscape do you have near your house. Having a light coloured roof will tend to reflect the heat (see the Dulux cool roof colours range) and make your house look taller, which is great if your house has a low roof or a shallow point. Choosing a darker colour will more likely absorb that heat (which is great in winter) and also make a high or tall roof seem less overwhelming. When restoring a roof, ultimately it will be the coloured finish coatings that are going to be subjected to our harsh Queensland climate. The integrity of this layer is critical on the binding (first) coat applied to your roof. Dulux AcraTex is a great choice due to their excellent adhesion from the range of binding coats offered. The Dulux Cool Roof paint range (AcraTex membrane with InfraCOOL technology) is available for many of the colours in the AcraTex 962 Roof Membrane range. Below is dulux acratex colour chart for the 962 roof membrane range. Read the full Dulux AcraTex 962 Cool Roof with InfraCOOL Technology Gloss data sheet. 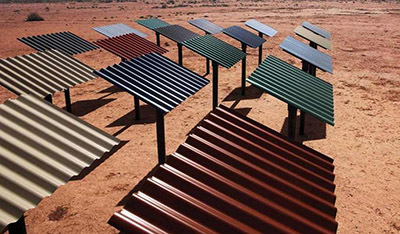 COLORBOND® steel roofing is tried and tested in the Australian conditions and used on a wide variety of residential and commercial roofing jobs. Colorbond has 22 roofing colours in the range, so you can easily choose a roof colour that sets the tone for your whole home, or complements your other choices of building materials. At Roof Painters Brisbane we can repair, paint (& assist in choosing a roof colour), and restore your roof no matter whether it’s a metal or tile roof! We cover all areas of Brisbane North and South sides. Speak to us and we can come to your home and offer some advice or visit our Brisbane roof painting page for more information.